Dr. Tilman Richards is pleased to offer gum disease treatment to patients who are suffering from a variety of gum disease symptoms, including chronic bad breath, painful gums, and swollen gums that bleed during brushing. Dr. Richards offers the Laser Assisted New Attachment Procedure (LANAP®), a state-of-the-art laser gum surgery for Kingsville, TX patients who are suffering from gum disease symptoms. Dr. Tilman Richards is offering laser gum surgery to Kingsville, TX. Dr. Tilman Richards seeks to help gum disease patients fight off the disease and decrease their chances of developing other gum disease-related diseases by receiving immediate gum disease treatment. Dr. Richards offers a variety of treatment options that are designed to alleviate gum disease symptoms, including Laser Assisted New Attachment Procedure (LANAP®), which is an innovative laser gum surgery now available to Kingsville, TX patients. Millions of Americans suffer from gum disease, although many of them are unaware that they have it. Gum disease symptoms can range from subtle and annoying to obvious and painful, depending on the stage and severity of the disease. Common symptoms of gum disease include swollen gums, tender or bleeding gums, and chronic bad breath. Individuals who experience any of these symptoms are encouraged to seek gum disease treatment before the disease has a chance to progress and contribute to the development of other, more dangerous diseases. There is a correlation between untreated gum disease and many other health conditions, including pancreatic cancer, diabetes, and low birth-rate babies. Patients who want to avoid these health problems are encouraged to seek treatment at the first sign of gum disease symptoms. Dr. Richards is one of the few dentists who now offer laser gum surgery to Kingsville, TX patients who are seeking treatment for their gum disease symptoms. For many dental patients, the minimally invasive LANAP® is a welcome alternative to traditional gum disease surgery. When Dr. Richards performs LANAP®, he does not cut the gums with a scalpel or use stitches. Instead, he utilizes a highly advanced and precise laser that is designed to target the harmful bacteria that causes gum disease and remove it without negatively affecting healthy gum tissue. Due to the precision and minimal trauma associated with LANAP®, it has quickly become a preferred gum disease treatment for many patients. Gum disease patients who want to reduce their symptoms by receiving laser gum surgery in Kingsville, TX are invited to find out if they qualify for LANAP® by calling Dr. Richard’s office and scheduling a consultation. Tilman Richards, DDS is a general dentist who has provided patients personalized dental care in Corpus Christi, TX since 1984. Dr. Richards graduated with honors from Sam Houston State University with a Bachelor of Science in biology, and he attended Baylor Dental School in Dallas where he received his degree as a doctor of dental surgery. 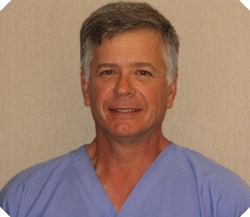 He is also a member of the American Dental Association, Texas Dental Association and Nueces Valley District Dental Society. Dr. Richards is part of one percent of dental professionals providing the LANAP® FDA cleared laser procedure for gum disease treatment. To learn more about Tilman Richards, DDS and his dental services visit his website at http://www.corpus-christi-dentist.com and call (361) 238-2373.